A student who developed her leadership skills through her time at Laurier. A woman whose love of language led her to help thousands of students improve their writing skills. A young entrepreneur who started building his concert business before he graduated from university. A teacher and researcher who fosters within her students an understanding and a love of science. A giant in the advertising industry who shares his creativity with clients from Ikea to Laurier — his alma mater. These are the recipients of the 2015 Awards of Excellence presented on Thursday, May 7 by the Wilfrid Laurier University Alumni Association (WLUAA). This year’s recipients are Victoria Gee (Student Alumna Of The Year), Emmy Misser (Schaus Award For Staff), Paul Maxwell (BBA '07) (Young Alumnus Of The Year,) Hind Al-Abadleh (Faculty Mentoring Award), and Andy Macaulay (BBA '80) (Alumnus Of The Year). They embody what it truly means to be part of the Laurier community. The awards give WLUAA an opportunity to recognize people — alumni, faculty, staff, students and friends — who are enriching the student experience and positively contributing to Laurier. The individuals recognized this year, along with past award recipients, are commemorated in a special awards wall in Alumni Hall at Laurier’s Waterloo campus. The display is a striking exhibit that features all award recipients, scholarship winners and past WLUAA presidents. The event also included the presentation of the Tom Berczi Citizenship Scholarships. 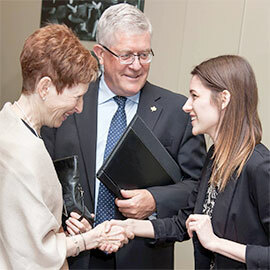 These awards were established by the Alumni Association to recognize students who combine academic achievement with generous volunteer involvement within the Laurier community. The seven students who received the scholarships have not only achieved marked success academically, but also given back to their communities and provided leadership where it is most needed.